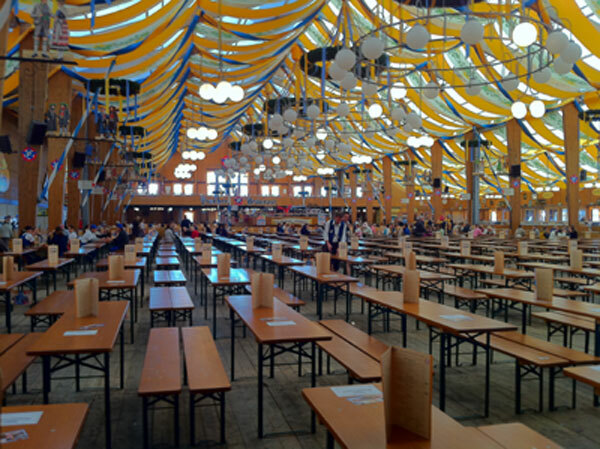 In Munich, specific biergarten tables are used inside the Oktoberfest tents. These tables have narrow table tops and benches. This is most likely in an effort to fit as many tables as possible inside the tent. As well, the benches at Oktoberfest are usually placed right next to the bench of the adjacent table and you need to stand on the benches to get in and out. Later in the evening, everyone in the tent is encouraged to stand on their benches to sing and dance. Surprisingly, despite their small size, these benches can easily support five grown men. Below are a number of companies that sell biergarten tables. Prices vary and not all companies ship worldwide. Be sure to read each business' page carefully. Backyard Oktoberfest provides these links as a convience for you and we currently have no affiliation with the sites that sell you the tables. If you do purchase a table from any of these sites we would appreciate it if you would let us know what you think so as to better help others looking to purchase tables. Thanks. Beer Garden Furniture, LLC offers the highest quality European furniture with the personal touch of a small company. 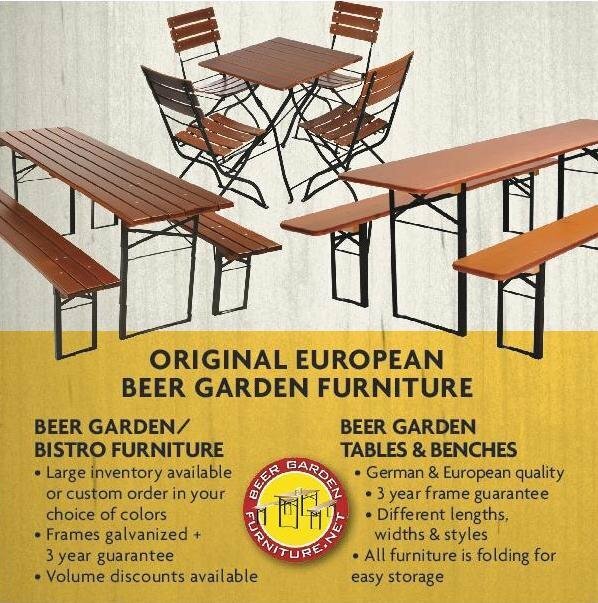 Order everything from original beer garden tables and benches to traditional beer garden/bistro tables and chairs, all of which are made in Germany and Europe. By the way, Germany is where the beer garden originated. Beer Garden Furniture, LLC's outdoor furnishings provides the perfect touch to your brewery, bistro, winery, restaurant, or home patio. Brewery quality. If the event gets vibrant, quality and stamina is required. Our "Classic" beer set is characterized by stability and reliability. Available in different sizes, colours, varnished, glazed, or even personalized: this Oktoberfest set will fulfill all your wishes ... Indoor and outdoor. 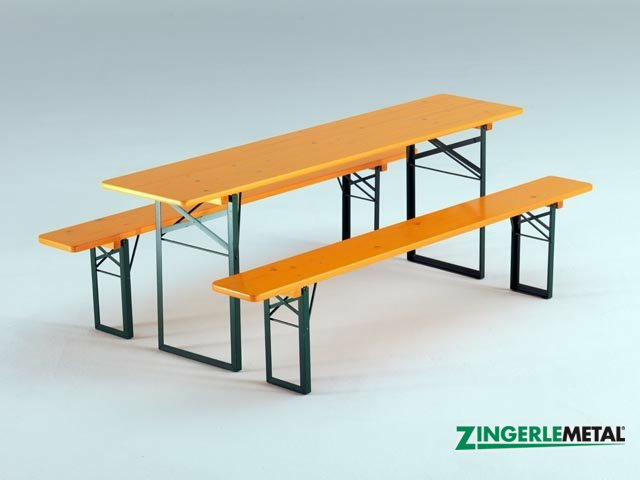 ZINGERLEMETAL classic sets are made from selected spruce woods. Together with the base frames, made of sturdy angle steel, they guarantee a long-lasting functionality. For 60 years now the superior resistance to mechanical stress, to weathering and abrasion made this tables and benches to the first choice for thousands of content customers. This set holds what we promise! And best yet, our table and bench set folds away for very simple and practical storage. If you: Have extra company and never enough chairs Live in a smaller apartment but need extra seating for parties Or don’t want to leave your furniture outside in the weather then this is the outdoor furniture set for you!